This Tester is designed for road pilot of luggage with wheels, traveling bag, wheels, wheel axle; can test abrasion capacity of wheels material and deformation and damage of suitcase structure. The test result can be a reference to improvement. 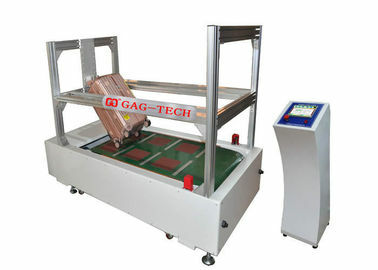 Luggage Walking Fatigue Testing Equipment applied to all kinds of luggage and suitcase manufacturers. To improve products quality according to test results.And the machine used to test for the luggage with a wheeled, such as a suitcase, traveling bags, it can test the wear-resistance of the wheel and the overall structure of luggage, check its damage or not. Test results can be used for improving the product quality. This machine is used to test for the luggage with a wheeled, such as a suitcase, traveling bags, it can test the wear-resistance of the wheel and the overall structure of luggage, check its damage or not. Test results can be used for improving the product quality.